Meet our wonderful four legged employees! From the left, Buck, Maude, Chevy and Ford! These are our draft horses that pull our wagons and sleighs over the river and through the woods to help you find your perfect Christmas tree!! We also provide old fashioned hay wagon rides pulled by tractors and smiling faces. 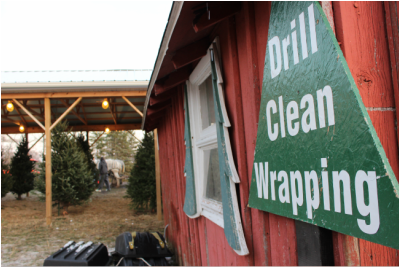 Once you have found your Christmas tree, we will prep it for the ride home. We trim the base of the tree, shake it to make sure you don't take any birds home, and drill it to fit our "Answer Stands" (that stand your tree in ten seconds)! We will also wrap your tree for a safe journey home.